Australian travellers have been told to reconsider trips to Bahrain after security forces opened fire on demonstrators in escalating protests against the governing regime. More than 60 people are in hospital undergoing treatment for wounds they sustained as they headed to Pearl Square on Friday. The shootings occurred on a day of mass mourning, when Shiites buried the four people killed a day earlier in the police raid on the Pearl Square traffic circle. Foreign Minister Kevin Rudd said the situation in Bahrain had deteriorated, and there were also worrying developments in Libya. "We have seen clear reports of fatalities among protesters and a large number of injuries as well," Mr Rudd told reporters in Sydney. "The travel advisory for Bahrain now reads that Australians should reconsider their need to travel due to the unpredictable security situation as a result of recent clashes between protesters and government security forces." Mr Rudd also called on Bahrain to respect its people's right to demonstrate peacefully. He said the government there needed to do more to meet the desire for political and economic reform in the country. The Department of Foreign Affairs estimates there are 1,000 Australians in the tiny, oil-rich kingdom. Democracy protests have been met with brute force not only in Bahrain but also in Libya, Yemen and Djibouti, since similar protests in Egypt toppled president Hosni Mubarak's government just over a week ago. On Friday, thousands of Bahrainis took to the streets despite a government ban on protests. Bahrain's opposition leader Ibrahim Sharif has told the BBC that troops have fired on protesters in the capital, Manama. "Today people went to the graveyard to pay their respects for one of the first person who was killed three days ago," he said. "And after they had paid their respects and prayed on the grave they went towards the Lulu roundabout - it's about three kilometres away from the village - and they approached the Lulu roundabout, about 300 metres. They were attacked by uniformed troops, the army." Mr Sharif says the wounded have been taken to hospital. "We understand there are about 22 injured people, including two in critical condition in the operation room," he said. "The number was not very large - about a couple of thousand people - and the live ammunition had been used. "I don't know what kind of ammunition but there are bullet wounds in the protesters." Crown Prince Salman bin Hamad al-Khalifa has promised to open a sweeping national dialogue once calm returns. "I express my condolences to all Bahrainis because of the painful days that we are living through," he said. "I would like to address them with a message, a message of a citizen, a message for men to be calm. "We need time to evaluate what happened and to regroup together again, and to restore our humanity, culture and future." US president Barack Obama spoke with the king on Friday evening, condemning the violence and urging the government to show restraint. Mr Obama said the stability of Bahrain, home to the US Middle East fleet, depended upon respect for the rights of its people. In North Africa, Libyan leader Muammar Gaddafi is facing an uprising in the coastal city of Benghazi and used security forces to hit back at protesters. While information is difficult to get out of Libya, there have been reports of at least 46 deaths. Journalists are not allowed to travel to Libya, but a Benghazi resident says authorities have warned of a fierce response to unrest. "Anybody that they find the government kills. They'll check their ID, okay, and if they find out which family you're from they will go and imprison your family or they'll demolish your house," the resident said. "This is what happened to five people in Benghazi." Colonel Gaddafi's supporters have taken to the streets of the capital, Tripoli, to enforce the message. In neighbouring Egypt the fallout from the toppling of Mr Mubarak is still being felt. Huge crowds again packed Tahrir Square in Cairo for what is becoming a regular Friday demonstration of people power. Bahraini's hold protests outside of interior ministry. Thousands of Bahraini protesters have gathered outside al-Qudaibiya Palace, where Bahrain's cabinet meets, to call for an end to monarchy. Protesters gathered outside the palace, chanting “Down, down al-Khalifa" and "No dialogue with the killers," Middle East Online reported on Sunday. Meanwhile, anti-government protesters continue to camp in the capital's Pearl Square for a third consecutive week, saying they will stay there until their demands are met. The protesters have been demanding constitutional reforms and an end to monarchy. They have also been calling for free and fair elections and the release of all political prisoners. Demonstrations have planned to gather outside the US Embassy in Manama to protest against Washington's meddling in their country's internal affairs. They have also called for demonstrations outside the United Nations building on Thursday to urge the international body to pressure King Hamad bin Isa Al Khalifa. A mass rally outside the government headquarters in Manama is scheduled for Friday. Last week, in an attempt to contain massive anti-government demonstrations, King Khalifa pardoned 23 political prisoners and ventured a minor cabinet reshuffle. However, the measures seem not to have been enough for the opposition who say hundreds of political activists are still in Bahraini jails, and for thousands of protesters who are still out, demanding the ruling family to step down. I haen't yet heard Mark Thatcher the second and arms dealer front man Diddy 'Condom Head' David Cameron calling for the head of the Bahrain royal family. Nor have MI6 & the SAS been into Bahrain with explosives and machine guns for the protesters so far to my knowledge. More appropriately when Saddam invaded 'poor little Q8' we faced six months propaganda of this fake statelet regarding the rights of its 'territorial integrity' then an invasion force was set up. Saudi Shi'ites marched in the kingdom's oil-producing east Wednesday, demanding the release of prisoners and voicing support for Shi'ites in nearby Bahrain, an activist and witnesses said. One Saudi Shi'ite activist said hundreds attended several protests including one in the eastern region's main Shi'ite center, Qatif, to show their backing for Bahraini Shi'ites who are protesting against the Sunni royal family. Bahraini forces used tanks and helicopters to drive protesters from the streets Wednesday, clearing a camp that had become a symbol of the Shi'ite Muslim uprising and drawing rare criticism from their U.S. allies. Leading Saudi Shi'ite cleric Sheikh Hassan al-Saffar voiced "dismay over events in Bahrain -- bloodshed, violation of sanctities and the intimidation of the people." Bahrain Police Shooting at Independent Cameraman Filming & Reporting! One of the side effects of the dirty US-Saudi deal is that the White House is doing all it can to make sure the Bahrain drama is buried by US media. Humanitarian imperialists will spin en masse this is a "conspiracy", as they have been spinning the bombing of Libya prevented a hypothetical massacre in Benghazi. They will be defending the House of Saud - saying it acted to squash Iranian subversion in the Gulf; obviously R2P - "responsibility to protect" does not apply to people in Bahrain. They will be heavily promoting post-Gaddafi Libya as a new - oily - human rights Mecca, complete with US intelligence assets, black ops, special forces and dodgy contractors. Whatever they say won't alter the facts on the ground - the graphic results of the US-Saudi dirty dancing. Asia Times Online has already reported on who profits from the foreign intervention in Libya (see There's no business like war business, March 30). Players include the Pentagon (via Africom), the North Atlantic Treaty Organization (NATO), Saudi Arabia, the Arab League's Moussa, and Qatar. Add to the list the al-Khalifa dynasty in Bahrain, assorted weapons contractors, and the usual neo-liberal suspects eager to privatize everything in sight in the new Libya - even the water. And we're not even talking about the Western vultures hovering over the Libyan oil and gas industry. But considering the latest high-value defections from the regime, plus the desired endgame ("Gaddafi must go", in President Obama's own words), Washington, London, Paris and Riyadh won't settle for nothing but the whole kebab. Including a strategic base for both Africom and NATO. ...The official Bahrain News Agency (BNA) said Monday that Abidli al Abidli was appointed editor-in-chief of the newspaper, replacing Mansour al Jamri, the son of the Shi'ite former opposition leader. "The board of directors earlier decided to sack Al Wasat editor-in-chief Mansour al Jamri, managing editor Walid Nouwaihidh, and head of local news department Aqeel Mirza," BNA said. "The panel has also decided to elect a new board of directors within a month." Analysts said Abidli has a lower political profile than his predecessor Jamri, whose father led Bahrain's Shi'ite opposition in the 1990s. Jamri returned from exile a decade ago after the country's king promised political reforms. Manama regime and Saudi-led forces in Bahrain remove the body organs of those killed in anti-government protests, a political observer says. “The bodies of the youths, who are being taken out of hospitals and killed, are being returned to their families with their organs missing,” Ralph Schoenman, the author of The Hiddedn History of Zionism told Press TV. “That's a replica of what the Israeli armed forces were doing in Gaza and other place with Palestinian prisoners - marketing their organs,” he pointed out. “It's a measure of the nature of the regime in Bahrain, and it's a measure of the politics of Saudi dictatorship,” Schoenman added. Two Bahraini Shia activists who were detained after weeks of anti-government protests have died in police custody. The interior ministry said Ali Issa Saqer, 31, had died when guards tried to restrain him for "causing chaos". Another detainee, Zakaraya Rashed Hassan, 40, had died of sickle cell disease, the ministry added. It was the second such death in a week. Several Shia activists have complained of being tortured while in custody. The government denies the allegations. (Warning: Towards the end of the story, there is a photograph of Mr Saqer's body which viewers may find disturbing). Following the latest trip of Bahrain Foreign Minister to Pakistan and requesting help from Pakistani government to pacify the protests in Bahrain, the official Pakistani forces is to dispatch to Bahrain to suppress innocent Bahraini people, ABNA correspondent reported from Pakistan. (Ahlul Bayt News Agency) - Following the latest trip of Bahrain Foreign Minister to Pakistan and requesting help from Pakistani government to pacify the protests in Bahrain, the official Pakistani forces is to dispatch to Bahrain to suppress innocent Bahraini people, ABNA correspondent reported from Pakistan. There is no information of the number of Pakistani troops to be deployed to Bahrain. But it is said to be one thousand to three thousand. It seems that due to the friendly and brotherly relations between Iran and Pakistan, Iran diplomats should consult with Pakistani government and warn them of bad sequences of middling in other countries interior affair. "THEY JUST CAME! They took my dad, my dads blood is still on the stairs! They hit my dad so much! They beat him and he couldn't breath." She wrote the above just minutes after three members of her family were beaten and taken away by masked police officers. Mr. Alkhawaja, a prominent human rights activist, was taken along with her daughter's husband, and brother-in-law. They are among an estimated 600 detainees in custody following weeks of protest. In the past two months, Bahraini authorities have been brutally cracking down on pro-democracy protesters. Hundreds have been arrested and dozens killed by security forces and troops from neighboring Saudi Arabia and the United Arab Emirates. Notice the total lack of concern by the Human Rights champions of the world, ready to intervene militararily at the drop of a hat in Libya and Ivory Coast (where 'Regime Change' to install Yanki puppets is occuring), but not so much as an admonition to their friends the Bahraini, Saudi and UAR regimes over the brutal attacks on real 'Democracy' protesters (as opposed to US and others 'fomented' protests. Check the 'Care2' petition, for more details on the cases. I suggest people write to their representatives (MP's, Senators , Congressmen/women etc. regarding the Bahraini case, and pointing out the hypocrasy of their governments. Bahrain’s main Shiite opposition group said the Sunni-led government has demolished 30 mosques since quelling political unrest in the Persian Gulf nation last month. The government “can’t justify the demolition,” al-Wefaq said in an e-mailed statement received today. “Any attempt to showcase the measure as a legal action will neither be convincing nor objective,” the opposition bloc said. Bahrain’s security forces have been arresting activists and others including doctors since riot police drove protesters from their rallying point at the Pearl Roundabout in the capital Manama on March 16. The government declared a three-month state of emergency after Saudi Arabian-led troops arrived to help quell mainly Shiite demands for democracy and civil right inspired by the toppling of leaders in Tunisia and Egypt. The Ministry of Justice said the buildings were “illegal” and “unlicensed” and demolished “to protect houses of worship and maintain their sanctity,” Bahrain News Agency said April 22. Justice Minister Sheikh Khalid bin Ali al-Khalifa said describing the situation “otherwise” was an attempt to “undermine the nation’s image and instigate sedition,” according to the news service. Bahrain, an island nation, hosts the U.S. Navy’s Fifth Fleet. Shiites make up about 70 percent of the population of less than 1 million and many retain cultural and family ties with Iran as well as with Muslims of the same sect in Saudi Arabia. Other Gulf nations have arrested activists and bloggers in an effort to put down unrest in a region that holds the world’s largest proven oil reserves. Saudi Arabia, a member of the Group of 20 leading economies, has detained more than 160 dissidents since February as part of the government’s crackdown on protests, Human Rights Watch said April 20. More than 30 Bahraini medical workers have disappeared since security forces quelled Shiite-led protests, Physicians for Human Rights said on April 22. The crackdown killed at least 21 people, the Bahrain Human Rights Society said March 22. Activists and opposition leaders, including Ebrahim Sharif, a secular Sunni and head of the National Democratic Action Society, have also been arrested. The government denies that security forces have attacked hospitals and doctors, the official Bahrain News Agency said yesterday, citing a statement from Huda Nunu, the country’s ambassador in Washington. Medical facilities are “operating normally,” Nunu was cited as saying by the news service. According to a document released by Wikileakes, Bahraini security forces are secretly cooperating with Israel's notorious intelligence service, Mossad. The leaked cables suggest that Manama has established intelligence and security ties with Tel Aviv with the full backing of the country's King Hamad bin Isa Al Khalifa. The cables report private talks between the then US ambassador, William Monroe, and the Bahraini king in Manama on February 15, 2005. "He [the king] revealed that Bahrain already has contacts with Israel at the intelligence/security level (Mossad) and indicated that Bahrain will be willing to move forward in other areas," said Monroe's report back to Washington, adding that the Bahraini King boasted of such ties with Israel. Has the Khalifa family gone mad? Yesterday, the Bahraini royal family started an utterly fraudulent trial of 48 surgeons, doctors, paramedics and nurses, accusing them of trying to topple the tin-pot monarchy of this Sunni minority emirate. The defendants in this flagrantly unfair military court are, of course, members of the majority Shia people of Bahrain. And since I was a witness to their heroic efforts to save lives in February, I can say – let us speak with a frankness that the Bahraini rulers would normally demand – that the charges are a pack of lies. Doctors I saw, drenched in their patients' blood, desperately trying to staunch the bullet wounds of pro-democracy demonstrators shot in cold blood by Bahraini soldiers and police, are now on trial. I watched armed policemen refusing to allow ambulances to collect the wounded from the roads where they had been cut down. These are the very same doctors and nurses I stood beside four months ago in the Sulaimaniya emergency room, some of them weeping as they tried to deal with gunshot wounds the like of which they had never seen before. "How could they do this to these people?" one of them asked me. "We have never dealt with trauma wounds like these before." Next to us lay a man with bullet wounds in the chest and thigh, coughing blood on to the floor. The surgeons were frightened that they did not have the skills to save these victims of police violence. Now the police have accused the doctors and staff of killing the patients whom the police themselves shot. How could these fine medical men and women have been trying to "topple" the monarchy? The idea that these 48 defendants are guilty of such a vicious charge is not just preposterous. It is insane, a total perversion – no, the total opposite – of the truth. The police were firing at demonstrators from helicopters. The idea that a woman and child died because they were rejected by doctors and refused medical treatment is a fantasy. The only problems medical staff encountered at the Sulaimaniya hospital – and again, I was a witness and, unlike the Bahraini security authorities, I do not tell lies – was from the cruel policemen who blocked patients from reaching the medical facility. In truth, of course, the Khalifa family is not mad. Nor are the Sunni minority of Bahrain intrinsically bad or sectarian. The reality is clear for anyone to see in Bahrain. The Saudis are now running the country. They never received an invitation to send their own soldiers to support the Bahraini "security forces" from the Bahraini Crown Prince, who is a decent man. They simply invaded and received a post-dated invitation. The subsequent destruction of ancient Shia mosques in Bahrain was a Saudi project, entirely in line with the kingdom's Taliban-style hatred of all things Shia. Could the Bahraini prime minister be elected, I asked a member of the royal court last February? "The Saudis would not permit this," he replied. Of course not. Because they now control Bahrain. Hence the Saudi-style doctors' trial. Bahrain is no longer the kingdom of the Khalifas. It has become a Saudi palatinate, a confederated province of Saudi Arabia, a pocket-size weasel state from which all journalists should in future use the dateline: Manama, Occupied Bahrain. A car bomb explosion near the British embassy in Bahrain’s capital, Manama, points more to a propaganda stunt by the Western-backed regime than to a “terrorist attack”. Notably, the apparent attack in the capital’s Diplomatic Area in the early hours of Sunday came the same weekend it was announced that two former police chiefs from the US and Britain were appointed by the autocratic rulers to “reform” the Persian Gulf Kingdom’s security forces. Bahrain – which has been a key Western ally since nominal independence from Britain in 1971, serving as the Persian Gulf base for the US Navy’s Fifth Fleet – was the subject of discomfiting criticism last week when a high-level inquiry reported on widespread human rights violations committed by its security forces. It seemed too good to be true when the royal-appointed human rights commission highlighted manifold violations by the regime. Both Washington and London – the main patrons of the unelected Al Khalifa monarchy – issued statements expressing concern over the extent of crimes and abuses reported by the Bahrain Independent Commission of Inquiry (BICI). But such reaction from the Western backers of the autocratic Sunni monarchy smacked of cloying cynicism. For it was Washington and London that gave the green light in the first place for the withering crackdown against pro-democracy protests in the oil-rich Gulf kingdom that erupted in February 2011. The crackdown escalated in March with the invasion of troops from Saudi Arabia and the United Arab Emirates, and continued unabated for the past eight months. The BICI headed up by US-educated legal expert Cherif Bassiouni was apparently initiated in June by Bahrain’s King Hamad Al Khalifa to “investigate allegations” of what to many observers were obvious and flagrant violations against unarmed civilians following the US/UK approved Saudi-led crackdown in Bahrain. Several international human rights groups, including Amnesty and Human Rights Watch, had already catalogued the repression in Bahrain. So, that the BICI found evidence of “systematic abuses” and “excessive force” is no grounds for congratulating the BICI. This is the very kind of “discovery” that the most cursory, independent probe would be expected to find. That the US and Britain responded with “dismay” at the “disturbing” findings is no grounds either to believe that such reaction reflects surprised concern. How could it when these powers approved the violations in the first place? Their admonitions to the Al Khalifa regime to “implement” recommendations by the Bassiouni inquiry for release of hundreds of detained protesters and to uphold human rights are equally hollow and cynical. The real purpose of the BICI seems to have been to whitewash the Bahraini rulers and allow continued (hypocritical) Western support of the regime at a time when these powers are making such a “principled” stance against Syria over alleged human rights violations. Yes, the BICI did point up the (obvious) violations, but the implication from its finding are that these violations were committed by lowly ranks. Nowhere did the inquiry impugn the rulers or their Western sponsors, let alone call for prosecutions. Washington and London’s reaction, which commended King Hamad for his appointment of the inquiry, appear to dovetail neatly with this whitewash. Calling on the king to uphold its recommendations serves to legitimize the rulers as being willing, or capable of adhering to, international standards. In the long view, what appears to be going on in Bahrain is a coordinated public relations exercise choreographed from Washington and London. The appointment of the Bassiouni inquiry at the end of June came a couple of weeks after Bahrain’s Crown Prince Salman was feted in Downing Street and the White House, where the regime announced a “national dialogue” with oppositionists. The commission of inquiry seems to have been designed as a sweetener to engage the pro-democracy movement in a political dialogue that from the outset is carefully framed to advantage the rulers, that is a dialogue that does not, cannot, pose a serious challenge to the positions of power held by the Western-backed rulers. The appointment of two former US and British police chiefs to “oversee reforms” of Bahrain’s security forces appears to be part of this choreographed whitewash. Former Miami police commander John Timoney has been criticized in the past for heavy-handed tactics against American citizens; while John Yates was forced to resign his position in London’s Metropolitan Police in July over the Murdoch press phone-tapping scandal. Both men are hardly qualified therefore to oversee genuine reforms in Bahrain. And, indeed, their appointments can be understood as not being aimed at achieving any substantive reform, but rather merely the appearance of reform. Furthermore, the Bahraini Ministry of Interior is a creature of British policing. Between 1968-98, the head of Bahrain’s police was British Colonel Ian Henderson who oversaw the formation of a notoriously vicious force, including systematic techniques of torture and repression. From the whitewash point of view, one flaw in the BICI report was that it clearly stated that Iran has played no role in Bahrain’s recent uprising. This finding did not surprise many observers of the Bahrain pro-democracy movement because there never was any evidence of Iranian interference. However, the finding must have disappointed the Bahraini rulers and their Western backers, both of whom have regularly sought to invoke the Iranian bogeyman as a way of discrediting what is inherently and simply an uprising for basic democratic rights for the Shia majority in Bahrain who have been disenfranchised since the Al Khalifas were installed by their British patrons 40 years ago. This is where the latest car bombing near the British embassy in Manama comes in. No-one has pointed the finger at Iran yet. But the bombing comes at a time of rising tensions in the region between Britain and Iran over an attack on the British embassy in Tehran by protesters there, which in turn followed provocative sanctions by London in the ongoing Western campaign to target Iran. Suspiciously, local sources say that the Diplomatic Area in Manama where the incident occurred was sealed off for several hours by the regime before the explosion. British and American “liaison” with Bahrain’s Ministry of Interior may well result in “evidence” of Iranian involvement in the explosion. Or at the very least the incident will serve to heighten “national security” measures that will allow the Bahraini regime to suspend reforms recommended by the BICI and cynically echoed by Washington and London. In other words, another dissembling dollop of paint lashed on the choreographed whitewash of America and Britain’s key ally in the Gulf. Thousands of Bahrainis have launched a week of daily sit-in protests to reiterate the democratic demands of their revolution which has been ongoing since early 2011. (Ahlul Bayt News Agency) - On Friday, the Bahraini anti-discrimination demonstrators assembled at a monumental venue renamed "Freedom Square" in Al-Muqsha village, around seven kilometers west of the capital Manama, to commemorate their revolution. The protesters chanted anti-discrimination slogans and waved flags that called for the overthrow of the ruling Al Khalifah dynasty. Some banners directly referred to King Hamad, reading, "Down with Hamad." Organizers say the rally will last for a week and will take place every afternoon until midnight. "The Bahrainis will not go back on their demands," Abdul Jalil Khalil Ibrahim, head of Bahrain’s major opposition group, Al-Wefaq, told the Friday gathering. Bahraini troops heavily rely on tear gas and stun grenades to disperse peaceful anti-government protesters. Several Bahraini civilians, mostly senior citizens and kids, have also died from asphyxia after regime troops fired tear gas in residential areas and into homes. Amnesty International has warned about the Bahraini government's use of tear gas against anti-regime protesters and has called for an investigation into the tear gas-related deaths. Thousands of anti-government protesters have been staging demonstrations in Bahrain since mid-February 2011, demanding political reform and a constitutional monarchy which later changed to an outright call for the ouster of the ruling Al Khalifa family following its brutal crackdown on popular protests. More than 700 thousand citizens demanding to achieve self-determination, freedom and democracy and the rejection of dictatorship. Jailed prominent Bahraini human rights activist Abdulhadi al-Khawaja is in a critical condition and on the verge of lapsing into a coma after 55 days of a hunger strike, his daughter said in a statement on Tuesday. "He had two doctors accompanying him at all times last night, and today he is being moved to the fort prison due to lack of the necessary medical equipment in the central Jaw prison," Maryam al-Khawaja said. "This is due to fears that he may go into a coma at any time, as his blood sugar and blood pressure have both further dropped." Abdulhadi, also a Danish citizen and founder of the Gulf Center for Human Rights, was sentenced to life in prison in June 2011 for organizing peaceful protests calling for democratic reform in Bahrain. His imprisonment continues despite a recommendation by a government-established commission in November that all political prisoners be released unconditionally. The Bahrain Center for Human Rights has urged authorities to release al-Khawaja "on humanitarian grounds as his life is in serious danger, and getting to a situation where there might be an unrepairable damage to his physical well-being, if he survives." Amnesty International added to the chorus of condemnation of al-Khawaja's detention, demanding Manama immediately release the leading activist. "The continued imprisonment of al-Khawaja demonstrates that the Bahraini authorities are not serious about fulfilling their promises to release people imprisoned for exercising their right to free speech," Philip Luther, Amnesty International’s Middle East and North Africa director, said last week. Bahrain has witnessed more than a year of unrest with mass protests demanding democratic reform. Bahrain's government has avoided much international scrutiny due to its privileged position as a strategic ally of the United States, which bases its Fifth Fleet in the tiny Gulf state. US and UK officials are offering Bahrain’s authoritarians everything from PR tips to policing advice for their war against the masses. For decades, the people of this Middle Eastern state have lived under what is effectively a hereditary dictatorship. In spring last year, however, it looked like things might finally change. A long-repressed people began to feel emboldened. Protests gathered momentum. At last, it seemed, a more democratic, more open future beckoned. And then, the crackdown. The troops moved in, the shooting (and killing) started, and the summary arrest, detention and torture commenced in earnest. Now, you could be forgiven for guessing Syria. But you’d be wrong. The place I’m describing here is the small Gulf state of Bahrain, just off the coast of Saudi Arabia. Still, given the brutal repression, given the popular unrest, you would expect the West to have responded to events in Bahrain much as it responded to events elsewhere in the region. After all, Bahraini troops effectively began firing on their own people; and a disenfranchised majority struggling for some degree of political sovereignty, long withheld by Bahrain’s decidedly unconstitutional monarchy, is still being repressed. So did Western leaders issue strongly worded condemnations? Did US secretary of state Hillary Clinton call, as she has done with Syria’s chinless tyrant Bashar al-Assad, for Bahrain’s King Hamad to step down? Did British foreign secretary William Hague talk of some form of NATO intervention? Not exactly. In fact, both the UK and the US have consistently adopted a conciliatory position. Yes, ran official Western sentiment, some parts of the Bahraini state may have responded a little heavy-handedly to the protests, but it was nothing that some soft-focus reform couldn’t put right. So last March, as protesters were being shot at, White House spokesmen were simply urging the ruling Al Khalifa family to ‘show restraint’. Hague showed similar reserve in September, following the news that the Bahraini government had imprisoned any Bahraini medics found to have treated injured opposition activists. ‘This could undermine the Bahraini government’s moves towards dialogue and the reform needed for long-term stability’, he mithered. The fact that Bahrain’s Sunni autocracy, by its very persistence, is antithetical to the democratic aspiration of Bahrain’s thoroughly disenfranchised Shia majority is conveniently sidestepped. You can’t reform a contradiction. More striking still was UK prime minster David Cameron’s decision in December to welcome King Hamad into Downing Street. According to reports, Hamad wanted ‘advice on implementing reforms’. And Cameron duly advised. According to a British government spokesman: ‘He urged the king to… drive forward reform and reconciliation in the country, engaging with the opposition as part of that process.’ Well, that’s all right then. As I have written before, Bahrain is the point at which the hypocrisy of the West’s attitude to the Arab uprisings is writ large. While America, the UK and France were happy to pose, posture and bomb when it came to a pantomime villain like Libya’s Colonel Gaddafi, the far more problematic state of Bahrain offers no such easy moral capital. For a start, as opposed to the Libya of Mad Dog Gaddafi or Syria, positioned firmly on the Axis of Evil, Bahrain is a key strategic ally of the West. Indeed, for most of its modern existence, up until the 1960s, it was a British imperial outpost, a protectorate with the Al Khalifa family in cosy situ. As Bahrain was for Britain, so it is now for America, even to the extent that Britain’s old naval base is now occupied by its US equivalent. A Wikileaked cable from 2006 shows just how beloved the Al Khalifa family is of the US. ‘We feel we are protected by [America’s] presence’, King Hamad told an American diplomat: ‘Without you, we would be squashed.’ To intervene as abrasively as the UK and the US have done elsewhere in the region would be very difficult in a state that has proved so valuable to both countries. But the hypocrisy-rich case of Bahrain doesn’t just puncture the moral authority of the West. The Arab League is also exposed for the assortment of self-interested autocracies that it is. For while the league impressed the UN with its moral bluster over Syria, expelling it one week and sending in monitors the next, its silence on the repression in Bahrain speaks volumes. And little wonder it remained silent. One of the league’s principal members, Saudi Arabia, played a direct role in the repression of the Bahraini uprising. Following the imposition of martial law in March last year, King Hamad ‘invited’ over 1,000 Saudi troops, plus tanks, to ‘police’ the Bahraini capital of Manama. I say ‘invited’, but given the numerous reports, ‘invaded’ might be a better description. As one journalist noted: ‘A source close to Prince Nayef told [a BBC reporter] two weeks before the troops arrived that the Bahrainis were on notice that if they did not deal with the demonstrations, the Saudis would do it for them.’ And deal with it the Saudis did. Within 24 hours the protests had been ‘cleared away’. Direct Saudi intervention is understandable. The prospect of democracy in Bahrain, a majority Shia state right on its doorstep, must be a worry for Saudi Arabia’s Sunni autocrats - not least because their own Shia population is tiring of the Saudi state’s policy of discrimination and disenfranchisement. To this end, he has since appointed former Miami police chief John Timoney and ex-London Met assistant commissioner John Yates to oversee the ‘reform’ of the Bahraini police force. Admittedly, these appointments could be seen to follow in the venerable tradition of overseas involvement in Bahraini officialdom established by Ian Henderson, the British army colonel who for 30 years ran Bahrain’s security forces with such brutal aplomb that he gained the epithet, ‘the butcher of Bahrain’. Yates, more brown noser than butcher, is certainly doing a good job of presenting the nice side of Bahrain’s body of armed men. ‘The government has made excellent progress here’, he said in January: ‘Human rights training for 20,000 police officers is an immense undertaking.’ Incredibly, Yates not only excused the violent suppression of last year’s protests on the grounds that the police (and army) ‘faced extraordinary provocation’, he also advocated ‘kettling’ as a way of dealing with future unrest – ‘that would work really well round here’, he said. So what of the situation now? With ‘human rights-trained’ police out on the beat, it must be hunky dory, right? Well, given that around 200,000 people (about a third of Bahrain’s population) gathered to protest in a suburb of Manama a few weeks ago, and given the near nightly explosions of tear-gassed violence in the villages and districts around the capital, it all seems far from hunky dory. As one activist put it last week, ‘This is a war’. And it is a war which officials from Saudi Arabia, America and Britain are fighting in – on the anti-democratic, liberty-crushing side. Tim Black is senior writer at spiked. A group of MPs have launched a cross-party campaign calling for a halt to this weekend's Bahrain Grand Prix because of government crackdowns in the Gulf state. The Labour MP Jeremy Corbyn has won support for an early day motion from the Tory Peter Bottomley and the Liberal Democrat Bob Russell. The motion comes as the 12 Formula One teams arrive in the country to prepare for the weekend's event. Formula One is due to race in the kingdom despite daily disruption in the capital Manama and pledges from opponents to the governing regime to stage protests at the Sakhir circuit. Corbyn's motion said: "This House is astonished that the Bahrain Formula One race is going ahead despite huge concerns over abuse of human rights expressed by Amnesty International and others. "It notes that a trial is continuing of 52 medical professionals who tried to help victims of the suppression of protests. It believes that the Formula One race will be used by the Bahrain government as an endorsement of its policies of suppression of dissent. And it accordingly calls for its cancellation." Five MPs have so far signed the motion, which was tabled this week. The shadow foreign secretary Douglas Alexander has called for the race to be cancelled. "F1 bosses should call off the scheduled Bahrain Grand Prix. To go ahead at present risks sending the wrong signal at a time when the authorities in Bahrain should be focused on delivering real reform." But Jean Todt, the president of the FIA, Formula One's governing body, said on Sunday that the race was able to go ahead because conditions in Bahrain are "good and secure". Speaking to German television in China, he said: "We have spoken … with representatives of the government, with the embassies and with neighbouring countries, as well as with European foreign ministries. We have made an extensive examination with a lot of checks. It is clear the grand prix can go ahead. There has been some controversy about it but the FIA is a sports organisation. We are only interested in sport, not politics." The Bahrain race was cancelled amid violent protests last season after being scheduled as the opening event of the 2011 calendar. Attempts to reschedule it later in the year were unsuccessful but it was placed as the fourth event on the 2012 calendar. Track action is scheduled begin on Friday, ahead of qualifying on Saturday and the race on Sunday. LONDON: British Prime Minister David Cameron yesterday defended Bahrain Formula One Grand Prix, saying that "Bahrain is not Syria". "We should be clear: Bahrain is not Syria; there is a process of reform underway," he said in a statement published in newspapers and posted on British websites. Reacting to calls of the Shadow Government and the Labour leader for the race to be called off, Mr Cameron reaffirmed his government's support for Bahrain's reform process. "This government backs that reform and wants to help promote that reform." Former Metropolitan Police deputy commissioner John Yates says he feels safer in Bahrain these days than in London, which isn't surprising, Bahrain being a couple of thousand miles away from the phone-hacking scandal. 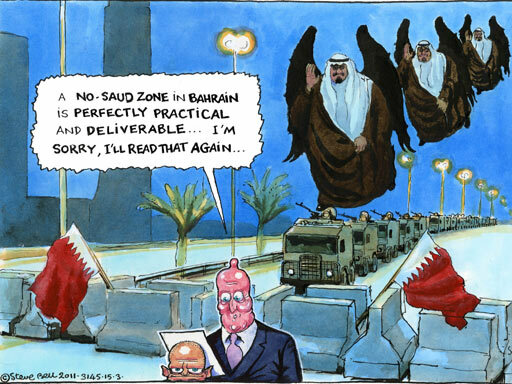 Mr Yates is employed in Bahrain as chief adviser on policing to King Hamad bin Isa al-Khalifa, whose Sunni regime has been under pressure since February last year when the Arab Spring dawned briefly on the tiny (population 600,000) Gulf state. Citizens, mainly from the majority Shia community, took to the streets demanding elections, free speech, an end to arbitrary arrest and torture and the removal of the Al-Khalifa entourage, which sucked up and splurged out almost all of the state's oil revenue. Bahraini forces cleared the protestors in short order, killing seven. In March, as protests and violent repression continued, more than a thousand Saudi troops, invited in by al-Khalifa, marched over the border and succeeded in imposing order on the capital, Manama. In the mainly Shia villages in the hinterland, however, pro-democracy demonstrations have continued and continue routinely to be met with beatings, tear gas, house-raids and gunfire. Last year's security problems forced cancellation of the inaugural, hyped-to-the-heavens Bahrain grand prix, greatly to the chagrin of al-Khalifa, who had believed the event would help fast-track his fiefdom to the front rank of nations. He retains high hopes, though, that the 2012 race will go ahead this weekend. Yates of the Yard has been the key figure providing reassurance there's no need for nervousness. Mr Yates wrote last week to Jean Todt, boss of the race licensing body, the International Automobile Federation, saying that "the significance of the ongoing demonstrations should not be overplayed. These are not lawful protests but... criminal acts being perpetrated [by] people intent on causing harm to the communities in which they live. They are not representative of the vast majority of delightful, law-abiding citizens that I see every day." Not the latest flowering of the Arab Spring then, but a containable outbreak of Tottenham High Road-style hooliganism, of no significance for stability, or the security of the weekend's planned billion-pound event. This week, Amnesty International offered a different take: "No one should be under any illusions that the country's human rights crisis is over. "The authorities are trying to portray the country as being on the road to reform, but we continue to receive reports of torture and use of unnecessary and excessive force against protests." Bernie Ecclestone, Mr Todt's other half in the F1 duopoly, is in no doubt which version was more credible: "I know John Yates as a highly respected copper. I take his word." Yates took up the Bahrain post after resigning from the Met last July on threat of suspension by the Independent Police Complaints Commission, four days after Neil Wallis, former executive editor of the News of the World, had been arrested on suspicion of involvement in phone-hacking. Two years earlier, Mr Yates, in his capacity as chief investigator of the NoTW scandal, had announced that his inquiries had found no substance in a Guardian story that phone-hacking at the News International title had been routine and systematic. There was no need therefore, Mr Yates concluded, to trouble NI executives further. It quickly emerged that Mr Yates and Mr Wallis had been meeting regularly for lunches and dinners at the Ivy Club, Marco Pierre White's Luciano, Daniel Boulud's Bar Boulud and other upmarket London eateries. Mr Yates has explained to the Leveson Inquiry, via video-link from Bahrain, that this relationship played no part in the Met giving Wallis a PR consultancy, or bestowing other favours on senior NI employees, nor had it impacted at all on his investigations. Mr Yates will have had a chance to chew over these colourful events in February when another chum of NI bosses, Tony Blair, visited al-Khalifa, at that time hosting talks with Palestinian president Mahmoud Abbas. Maybe the pair discussed the piquant circumstances whereby old Blair sidekick Ecclestone had himself become something of a big noise with the Bahraini elite. Bernie had starred in one of the first juicy stories of Blair's stint as PM, having bunged the Labour Party a million pounds at the same time as Blair agreed to exempt Formula One from a proposal to ban tobacco advertising in sport. When the arrangement was publicised, Labour paid the money back. Now Bernie, Blair and Yates of the Yard have all fetched up in Bahrain, in various ways enhancing the prestige and strengthening the hold of al-Khalifa, while the mass of the people seethe with anger and yearn for Spring. Have they reported this pull-out on UK news? Labour MP Jeremy Corbyn won support for an early day motion which "believes that the Formula One race will be used by the Bahrain government as an endorsement of its policies of suppression of dissent". At the same time as that news was filtering through to teams out here, the All-Party Parliamentary Group for Democracy in Bahrain published an open letter which it has sent to some of Formula One's biggest sponsors, urging them to boycott this race. "Should the Bahrain Grand Prix go ahead," the letter read, "the sport and its associates run the risk of looking greedy and out of touch with the reality of the situation. "We are most alarmed that you see no grounds to sever your brand and save its reputation from a totalitarian regime." The letter, which was signed by Andy Slaughter MP, who chairs the all-party group which includes four Lords and 17 MPs, was sent to big names from Rupert Murdoch, the chairman and chief executive of News Corporation, to Dietrich Mateschitz, the CEO of Red Bull. Already the build-up of pressure has claimed its first victim, with Porsche Supercup squad MRS yesterday withdrawing its entry for this weekend's race, which is part of the Formula One undercard, citing security concerns. "It is the first time in our team history that we have had to cancel a race of the Porsche Supercup," team principal Karsten Molitor said. "In the end we have the responsibility for our employees." The event "backfired before it has even begun....The race has become a magnet for protest, a magnifying glass of dissent bubbling away below the surface. 'Don't race over our blood,' the slogan goes in Manama, but that is what Formula One teams propose to do today." Coverup and denial can't hide daily security force brutality. Videotape evidence documents it. So do independent media reports. "Britain and America make clucking noises but are just as cynical as the Bahraini royal family itself. Strategic alliances trump human rights. What is the difference between Bahrain and Syria?" The hypocrisy is glaring. Al Khalifa terror rages. F1 engines won't drown it out. Washington maintains silence. Bahrain's a valued ally. It's home to America's Fifth Fleet. In contrast, the Obama administration actively aids Syrian insurgents. Doing so violates America's Constitution and international law.